Another week for a blogger feature and this time it is Mr. Atin Shrestha from Kathmandu, Nepal. Quite new to blogging, he shares a passion for travelling, photography, writing and watching movies. I am just another normal person hailing from out of valley and living in Kathmandu. Just another body of dreams and ambitions. A face among the crowd. I am professionally, a civil engineer, graduated one year and eight months ago to be exact and I’m currently doing a 11-5 job for my engineering practice. I’m too much crazy of movies, its art and craft to be specific. Blogging and watching plays are my latest hobbies. I love reading books and writing some pieces when in mood. Besides these, travelling and photography are what I love more. Music, is a part of life. Coming to blogging, I’m relatively new to it. I totally love it. I’m active on two blogs: ‘At Some Point’ and ‘Movie Maniac’. At some point is more of like personal blog. (So, I wonder if personal blogs can interest anyone much!) Here, I write the stuffs that I can feel from heart. I write about the experiences I have had and generalize it in the post as I think that most of the random things we come over are someday somewhere relatable to others as well. Movie Maniac is where I write about movies. I’m not any movie critic but a regular audience who loves to analyze movie while enjoying through. I happen to love reviewing the movies. And I support Nepali movie industry through it, as much as I can do. I write about the Nepali movies I watch, goods and flaws of the industry, etc. 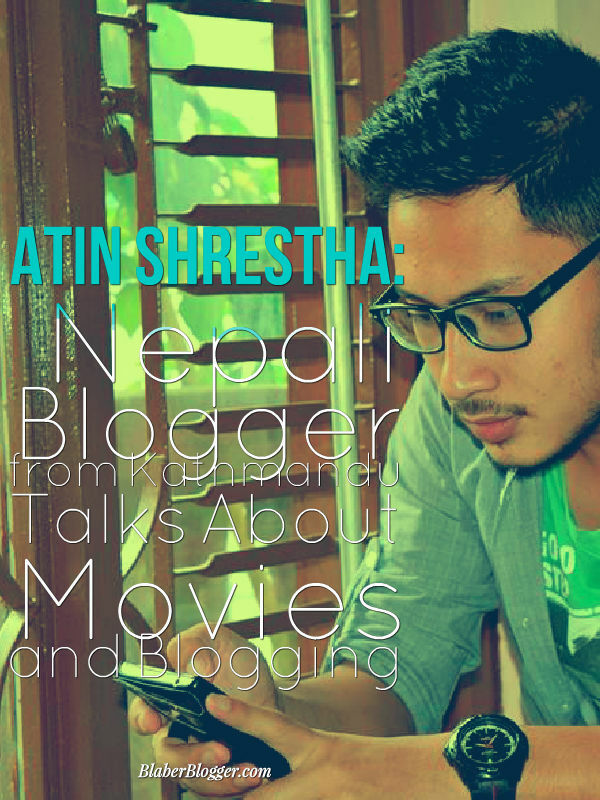 So, let me begin this interview with Nepali Blogger, Mr Atin Shrestha. When and why you started blogging? I’m quite new in blogosphere as I started blogging this 2015 January only. Express and explore are the two words for reasons. 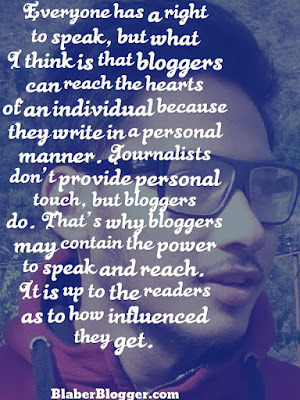 Blogger happens to be the platform for expressing your views and exploring others’. It’s fun, it’s good--enough for me to join. (Hehe..) And, my friend motivated me much. Where do you get ideas for blogging? When I write about the movies, it just comes as I sit down to write, especially when the hang of movie is still on me. Well, you know! For posts other than movies, ideas are everywhere around--people around me, places and societies, my own experiences, on-going matters, online buzz, etc., etc. As a blogger who writes about movies myself, I can relate to the fun of analyzing a movie and blogging about it. What is your views on this? If you’ve to suggest a foreigner to watch two Nepalese movies from any era, what would it be and why? This is quite hard because there are more than two movies, which are really very nice. Hmmmm….first would be Jhola because I find it the best Nepali movie till date. The story of Sati Pratha set on time of about hundred years ago, although known for all, was something new to watch onscreen and the way it has been presented is wonderful. One true Nepali film to the roots and to the core. Other would be Kabaddi for its beautiful presentation of simple story, performances, humor and satires, with modern day touch. One thing I liked best about Kabaddi is that it’s main story is set in Mustang, and not just for few scenes like we see in other movies. I can go on and on with movies. There are more good Nepali movies, such as Talakjung v/s Tulke and Loot. All these four are from recent times, and surely among very few quality movies. From yesteryears, I can name few like Balidaan, Dakshina, Prempinda, Mukundo, Darpanchhaya, etc. What seems like ‘highest top’ in blogging for you? Are you planning to reach it? I primarily started blogging to just share my views and get things off my chest, but I liked the idea of someone coming in to share their two cents and interacting with them in their own blogs. The highest top for me at the moment is getting more real and meaningful interactions with fellow bloggers and readers. I do hope readers follow me and care to leave a comment, but I currently don’t have a strategy for building a big following. What are the things that you enjoy writing about the most? Why? Movies, of course, reason being already told. Besides, I mostly enjoy writing about my experiences and the things around that I particularly notice more, because it helps me to maintain the memories while sharing joys and grieves. How much time do you spend blogging and how it involves in your daily life? What do you do when you don't have time for blogging? I don’t allocate time for blogging. But I write and post when I feel like doing it. Sometimes daily, or weekly, or even once in a month. I like to go with the flow. I had not been much active few past months due to the earthquake and all. But now, I am thinking of accelerating a bit. It usually gets involved in daily life anyhow. You know, even when I’m not writing, I ponder about things here and there--and again, daily life is where I get ideas from. When I get busy and don’t get time for blogging, I just push it for the next time as early as possible. I am trying to maintain it on a constant basis for now. Since, you’ve been maintaining a personal blog, what do you think about personal blogging? Your #KathmanduDiaries post sound really interesting and even when personal blog posts seems like it may not attract viewers, there are a lot of people who love to read it and enjoy them. What’s your view on that? Yes, I agree that personal blogs do not attract as much viewers as other genres would. By the term itself, it can get either a bit personal or too personal. Depends on what you share--some love to share being anonymous and some love being themselves. But there are readers, right? I love reading stories and all. Everybody has a story, is what I believe. So, personal blogs get you to explore somebody’s world and can make you think just normal. Philanthropic! I have recently started this #KathmanduDiaries under which I post random phases from my living in Kathmandu.I usually write about the experiences I have had and generalize it on the post. This is because I like to think that most of the random things we run into can be relatable to others as well—circumstances can get similar someday, somewhere. ‘Bloggers have the power to speak, reach and influence.’ What do you think of this statement? 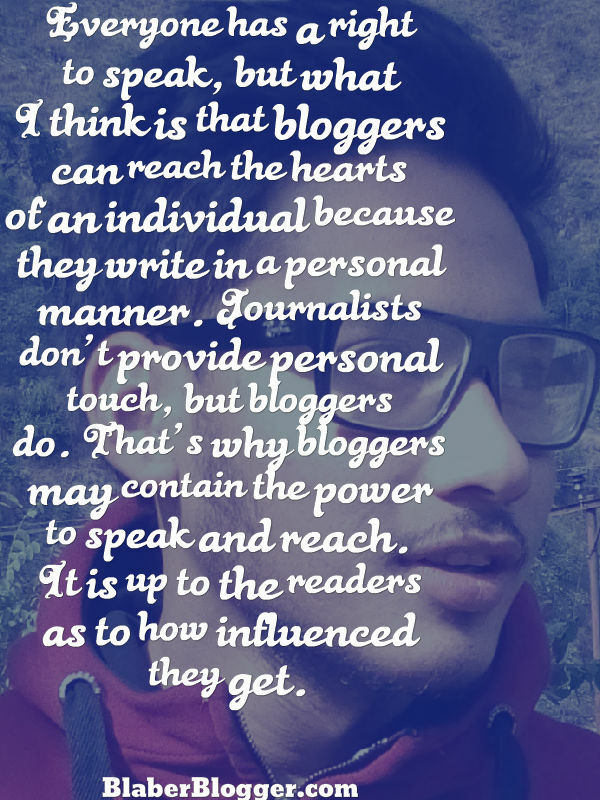 Everyone has a right to speak, but what I think is that bloggers can reach the hearts of an individual because they write in a personal manner. Journalists don’t provide personal touch, but bloggers do. That’s why bloggers may contain the power to speak and reach. It is up to the readers as to how influenced they get. What do you think about the blogging scenario in Nepal? There are so many bloggers and the wide varieties of subjects but only few of blogs are well maintained. Some tends to be like news site whereas some has personal blog like mine. Fashion and travel blogs are quite more to look at. I think Lex Limbu has to be the first name when blogging of Nepal comes to question. I think many starters have been motivated from his blogging. Blogging has provided a platform for many to express the opinions and make a discussion;also, I think this is being hiked up consistently here in Nepal, which is good. If you would have to give up blogging, what would replace it? How do you motivate yourself for blogging and where do you get your inspiration from? I try not to expect much regarding my blog statistics, following counts, and just stay on ground. It helps me to focus on writing without worrying. Five years from now, I can turn pages to older posts, read some of them and just smile in my life. It’s good. Mainly, I am so much inspired from Facebook pages like Stories of Nepal and Humans of New York. They are just so delightful and inspiring. Plus, there’s a friend of mine, who blogs about aviation in Nepal and is good on content. Then it’s you there, I like your fun posts. Getting new friends via blogging is a good thing. I came to know about this blog ‘Closet of Words’ through your blog and I liked it. I get these small things inspiring me for continuing blogging. Have you thought of monetizing your blog? No, not really for now. How about getting a domain for your blog, what’s your opinion on that? It would be nice to get a domain. But that’s pretty professional. I guess. I won’t be getting one for my personal blog. Share your own favorite post. How did you come up with that? My own post that I like the most is Increasing Women Violence: GenderDiscrimination and Equality. This is quite a long post--longest I’ve written. And I wrote it in a single sitting. At the time, newspapers were literally getting full of disturbing news of rapes, acid attack, discrimination, etc. and that disgusted me big time. I felt bad, I felt like expressing. I read the news, thought about the causes and effects, and then about the society around me and also, the behavior of people around me towards women. I just sat down and wrote it down. Editing happened the other day. What you will be blogging about when 80? What’s your goal with your blog you want to achieve by the end of this year? I look forward to more proper interaction with fellow bloggers and readers. Is there anything else you’d like to add that I haven’t included? And thank you so much for letting me express my views or kinda promote my blog. Haha… Cheers!